The bull — that passionate, earthy archetype of fertility and death — may be the totem beast of Spain, but he has little place in Barcelona. No, the creature the Catalans hold to their hearts is more fiery, more dangerous. Ever since 1229, when Count-King Jaume I had a vision of St George (Jordi) lending a hand at the siege of Mallorca, the most chivalric of saints has been the patron of Catalonia, and his encounter with the dragon, which according to the old legends took place in Syria, was transported to Montblanc near Tarragona. In 1285, Count-King Pere III climbed up the Catalans’ sacred mountain, Canigou (now in the French Roussillon), and the chronicles say he found a dragon up there, too. 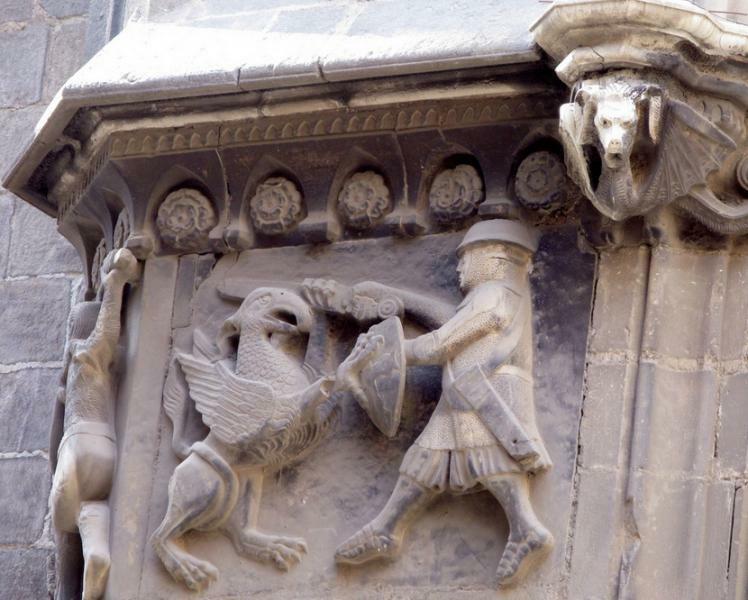 The legend of Jordi and his dragon was seamlessly grafted on to Catalunya’s favourite 9th-century dragon saga. It seems that the Moors, realizing they couldn’t defeat the counts of Barcelona, decided to play dirty and brought a baby dragon over from North Africa and set it loose. When it began to grow fat on the surrounding peasants, the father of Guifré the Hairy had the Christian derring-do to slay it at last. 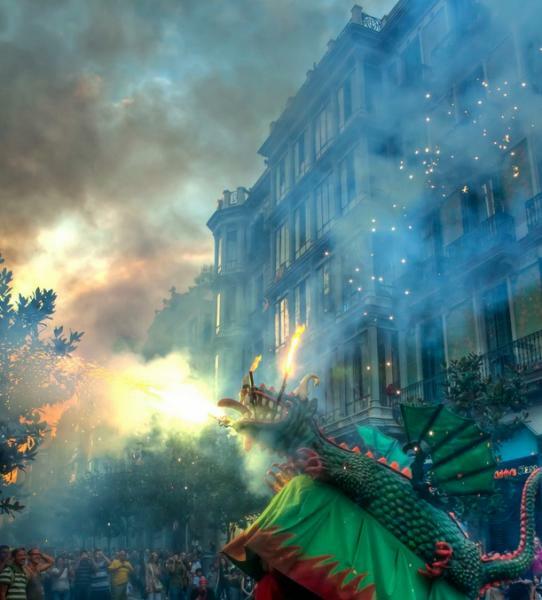 The dragon was skinned and displayed on feast days, and he is the grand-dad of all the dragons who come out to play during Barcelona’s festivals, spewing fireworks in the pandemonium of the correfoc, or fire-running. Modern Barcelona is in fact filled with dragons. A few are medieval, but the majority date only from the 19th century, when like all things Catalan they made a big comeback in poetry and art. Puig i Cadafalch and Gaudí were obsessed with them; the latter’s Casa Batlló has been called 'a dragon masquerading as a house'. The newest one, in the Plaça de l’Espanya Industrial, is a benign creature who doubles as a children’s slide. Some of the others are not much bigger than dachshunds. Very few even pretend to be threatening. In 1456, the Generalitat made George’s Day (23 April) the Festival of the Rose, the equivalent of Valentine’s Day, when men would give their love a red rose, just as George gave his princess the rose that sprang from the dragon’s blood. Since 1926 women have given their men a book, in honour of Cervantes and Shakespeare, who both died on 23 April 1616 (these days, some women give roses, men give books, many give both). Every year, thousands queue up to see the magnificent displays of red roses in the courtyard of the Generalitat. All the dragons in our life could be princesses who hope to see beauty and courage in us. Things which terrify us are helpless and hope that we will help them.